Tesla this evening unveiled their Semi electric truck, which is “the safest, most comfortable truck ever,” equipped with four independent motors. Company CEO Elon Musk unveiled the Semi, which is more aerodynamic than the Bugatti Chiron supercar ($2.6M USD), capable of going from 0-60mph with a full 80,000 pound load in 20 seconds. The power of the Semi also allows it to go 65mph (104kph) up 5% grades thanks to its four independent motors on rear axles. 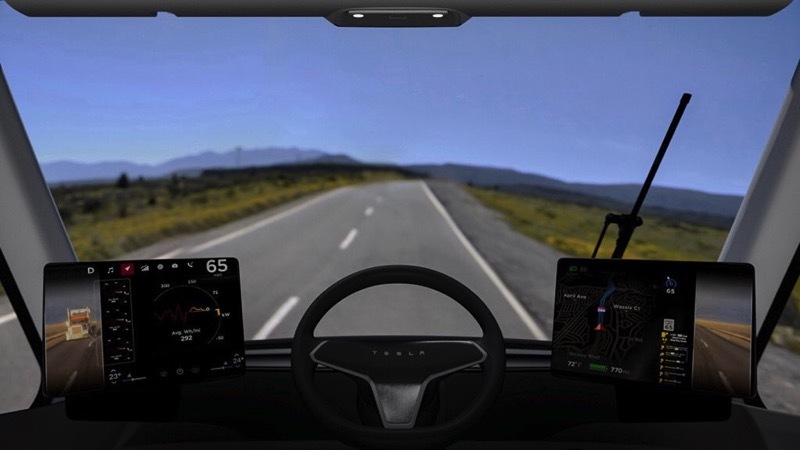 All Tesla Semi models come with Enhanced Autopilot to help avoid collisions, plus its centred driver position ensures maximum visibility and control, and a low centre of gravity prevents rollovers. Safety features will include standard automatic emergency braking, lane keeping assist, and forward collision warning, while Tesla Armor Glass prevents glass from breaking versus standard truck glass, ensuring drivers can stay on the road for longer. Tesla says if there is a crash and the car doesn’t hear from you, it will automatically call emergency responders. As for jackknifing, Musk said it will be “impossible” thanks to the Semi’s independent motors offering vehicle stability assist. The Semi has a range of 300 or 500 miles (482km or 804km) while driving at maximum weight at highway speeds. Charging takes 30 minutes to add 400 miles (643km) of range at Megachargers worldwide. 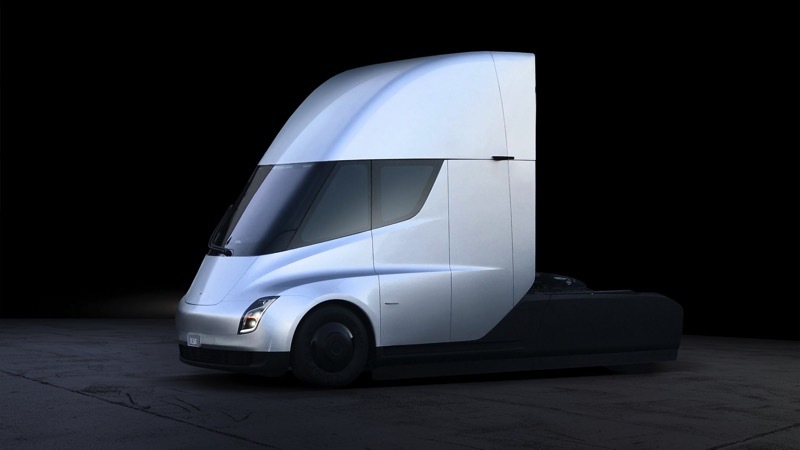 Tesla claims the electric costs of the Semi are half that of a traditional diesel semi truck, thanks to fewer systems to maintain (no transmission or brake pads to name a few), providing a number of over $200,000 USD in fuel savings, and a two-year payback period. The company is guaranteeing the Semi drivetrain will last to 1 million miles (1.6 million kilometres), equivalent to 40 trips around the globe. Elon Musk also said Tesla Semis setup in convoys of three trucks and Autopilot, will make transport cheaper than rail, as drag is reduced and energy saved. Tesla Semi will start production in 2019, with no prices revealed by the company yet, but deposits of $5000 can reserve one. The Roadster has three motors (one in the front; two in the rear) and is capable of going 0-60mph in a stunning 1.9 seconds, with a top speed of over 250mph (402kph) and 620 mile range (998km or over 1000km as Musk puts it) at highway speeds. The new Roadster seats four passengers (well, two small people in the back), comes with all-wheel drive and costs $200,000 USD (equivalent to $254,000 CAD), with a base model reservation at $50,000 USD and a “Founders Series” price at $250,000 USD (equivalent to $318,000 CAD). The car will be available in 2020. Elon Musk continues to disrupt the auto industry with Tesla’s innovations. The question remains whether the company can keep up with demand for its electric vehicles (Model 3 owners are still waiting to get their cars).